Giovanni Legrenzi is one of the key figures in the history of Italian music in the second half of the 17th century. Coming from a relatively humble background - he was born in the village of Clusone, near Bergamo, where his father was violinist at the parish church - his first post was that of organist at S Maria Maggiore in Bergamo. There he was responsible for the restoration of the city to its former glory as a music centre, which had fallen apart after the death of Alessandro Grandi during the plague of 1630. Legrenzi left Bergamo in 1655 and became maestro di cappella in Ferrara the next year. By 1670 Legrenzi was living in Venice, and here he played a crucial role in the establishment of the violin style of which Vivaldi was an exponent. The trio sonatas opus 2 which are recorded here were written to be played during mass, a practice which was widely spread in the Venetian part of northern Italy. In Bergamo this practice was introduced by Tarquinio Merula and Giovanni Battista Buonamente. In his liner notes Karl Böhmer characterises Legrenzi's sonatas thus: "In the early Legrenzi the imitative beginning in a fast tempo is usually still followed by the colorful sequence of short movements merging together that had marked the trio sonatas of the early baroque period. But the form (...) is already on the way to the sonata in several movements with sharply demarcated units." A good example of a sonata with strongly contrasting sections is La Spilimberga, the second item on this disc. Virtuosity is one of the features of these sonatas. An impressive example is the bassoon part of La Donata. In La Porcia Legrenzi uses the technique of pizzicato. Chromaticism was one of the most frequently used tools of expression at the time, which is demonstrated by the opening phrase of La Cornara, the very first item on this disc. Legrenzi was also a gifted composer of music for the theatre. It is perhaps his dramatic talent which is reflected in La Raspona with its gradual increase in tempo and virtuosity. It is interesting to note that Johann Sebastian Bach used a theme by Legrenzi in one of his organ works. According to Robert Hill this subject - which wasn't identified with any certainty before - could derive from the Sonata in c minor from opus 2. Unfortunately this statement in the booklet doesn't make much sense as the tracklist doesn't give the keys of the sonatas. The titles of the sonatas refer to personalities in Northern Italy. It is not quite clear whether this means that these sonatas are a kind of musical portraiture of these individuals. It is also possible that the names are given as a kind of reverence to them and perhaps as a way to ask for their patronage. The ensemble Parnassi musici has made some excellent recordings before, and seems to be especially interested in lesser-known repertoire. That is also the case here. 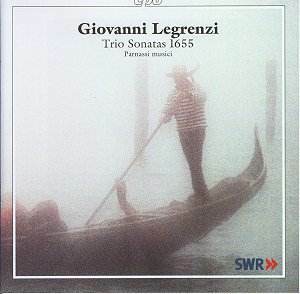 Important as Legrenzi's trio sonatas may be from a historical viewpoint, so far they have been largely neglected, and their recording by Parnassi musici is very welcome. The ensemble gives a technically flawless performance, with excellent ensemble playing. The interpretation is vivid, energetic and full of contrast. The virtuosity of Sergio Azzolini on the bassoon is most impressive. Even though these sonatas are not meant to be performed and listened to at a stretch, I didn't have any problems doing so. That tells something about the quality of both Legrenzi's sonatas and this ensemble's performance.